France is in the middle of a strike (again). Long story super, duper short (and without going into the heavy details), citizens are peeved with Mr. Sarkozy, his pension reform plans and retirement age increase. 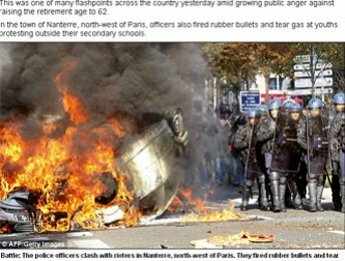 And because the French are experts at strikes, riots, and revolution (Hello Marie Antoinette! Where's your head at girl?! ), they don't just strike by walking around with poster board signs, chanting. Instead they get real creative with it. Like shutting down production at twelve of the country's oil refineries creative. There's something like a 1,000 gas stations around France that have run out of gas (thank you CNN). No gas! This does not bode well for the American girl living on top of a mountain in the middle of B.F.E. Provence. What am I supposed to do, harness Fifty to a little red wagon? (Can you imagine? "MUSH Fifty! MUSH!"). (I'd have shown you a video in Le Petit Village but we don't have a 'fuel station' because we're so petit). And on Monday, a bunch of cars were overturned and set on fire. But (big but here) according to France24, the overturned and burnt out cars were not done by any of the workers on strike, but school children who didn't know what to do when they showed up at school and the gates were locked due to their teachers being on strike. PHEW! Well, that's OK then. Just some bored school children who were so disappointed not to have that algebra quiz. (Oh, and a school in north western France was burned down but since we're not 100% sure if it's related to the strike or not, we're not going to worry about it). does anyone have a helicopter handy? You know when the French get pissed off they really get pissed off. Oh by the by Fifty informs CNN he is on strike as well and you can pull your own little red wagon. On mon petit I'm afraid he is still a little hurt about the rugby ball post. I have to say I just really like you. Maybe Johnny Depp can give you a lift? Or you can stay put and drink wine. Those crazy French and their strikes! James - Fifty has been in a huff! His inner Frenchness is coming out! ADOC - nope, never dull at all, but I'm ready for a good ol' dose of vitamins U. S. and A.
Intl Woman - crazy is right! So passionate those French peoples are. Well I guess I'd get pissed if someone tried to mess with my retirement too, but I'd probably kick people in the crotches instead of lighting cars on fire. Ahhh the art of manifestation!! The French strike with quite a bit of grandeur and panache lol. I've been wondering how far these strikes will go, seems like they're having quite q bit of fun. But methinks the whole causing people not to have gas is a bit too far. I mean come on not everyone has a dog Fifty's size, how will they manage? Though, I kinda wish I went or worked at school in France- I could really use a day off!! I'm glad I'm out in the sticks and not in Paris! Not sure how'd I'd go with riots. The maternelle school here was closed today, on strike, and I'm happy to report my 4 year old did not set any cars on fire. She did molotov cocktail the local police station, but that's just what we Australians like to do on Tuesdays. Jeez, that's awesome. I wish we could get it together to foment some civil unrest like that here. it's awful! the french really do love their strikes. Apathy is not something the French value. Thanks for stopping by my blog - hope things get resolved soon. Well, I think that Fifty will want more than a few doggy bones to pull a wagon rouge. He may even be joining a union to fight for his rights! My gosh, I was watching this on the news last night. Craziness! In Italy is the same... strikes for all! Strange they made strike on friday, why not on monday or tuesday? Only friday? In Italy people sometimes are so stupid! Believe me. I see your picture on tv yesterday, in Italy they do same things! Stupid people! I guess Sarah you didn't have the necessary informations to have this " ridiculous " point of view! wow! Pray the people that run the internet don't strike! I could live without gas, food, water. But internet? I would die without. Apparently a few years back the trash people in Germany went on strike. During the SUMMER. During tourist season. The streets in downtown were piled high with garbage. Can you imagine?? Police officials AND companies organised to count heads via software so probably pretty darn good at it say, 50,000. Someone forgot to carry the one. I have a 3/4 tank of fuel and am trying to ignore the whole thing. Bof! So crazy!!!!! I hope it all gets resolved soon!!! I think it's better in Aix today...I may try and go shopping later on. Shorty - they sure do! After all, they invented the guillotine! Homemaker Man - sounds like you've found yourself a new hobby! Jersey - oh we're fine! And in event of emergency, Fifty will save us all! Morgane - I'm not sure what point of view you're referring to. My only point of view is that I don't want to be stuck on top of this mountain with no petrol for the car to get me down. Hence the jokes about Fifty pulling a little red wagon and the helicopter. But I guess Fifty pulling me down the mountain in a little red wagon is pretty ridiculous. But pretty funny too! Becca - I'm with you! As long as I have internet and wine (lots and lots) I can probably stay inside for weeks and be quite content! T.M.C.O.H. - my fingers are crossed! Gabby - you make an excellent point. sarah louise i was respondind to a "sarah" comment not to your post darling ! I think the French love nothing better than to strike. I know my cousins get involved in everyone that comes a long. I heard on the BBC (not sure what they really know) that supposedly most of the labor unions are actually for the change in pension laws because they fear the system won't be able to sustain itself as is, probably true about not being able to sustain. I hope you're using your fuel sparingly!! How far up is the petit village? The strikes are annoying but what's really bothering me is the riots at the moment. Lyon city centre has become a no go area and is being destroyed. Businesses are loosing out left right and centre, I really feel for some of the small businesses etc that are really being put through hell at the moment. It's so sad and the riots do not create a good image of what's going on in France at the moment. Ugh. Scaryface. You are in my thoughts!! It's crazy isn't it! and here I am trying to get to Paris. don't worry ... it's a sensitive post ! I enjoyed this post and your insider perspective, and the perspectives of the comments here. So interesting. From all different angles. Bring back Napoleon! He knew how to deal with internal unrest. The first thing people in the UK ask me about at the moment are the strikes, but (apart from immense queues for petrol) things in Paris are kind of business as usual - I think the British news channels like to make out that the French are all hooligans!